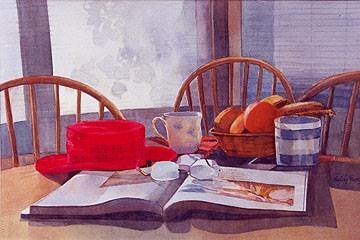 In May 1997, Daisy was elected to the Canadian Society of Painters in Watercolors. throughout Canada and the U.S. 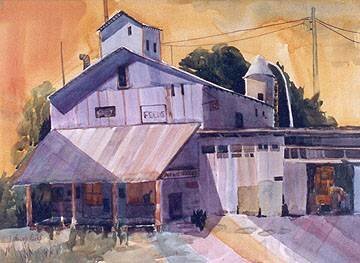 Her work has been accepted in juried exhibitions and she has won many awards. in Guelph, and her work is also in the Guelph Center at the Guelph Artisans. she was the sole artist for the 16-month 1991-1992 Gideon International Calendar. 1994, 1995 and 1997 Painting on the Green juried show, and won an award at Insights 1994 exhibition. Juror's Choice award at the Cross -section (COAA) in Etobicoke. of both the Guelph Arts Association and the Central Ontario Arts Association. 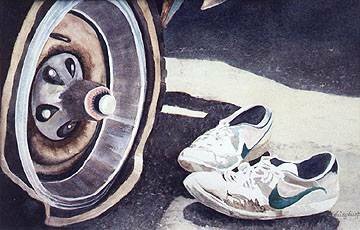 A study of a flat tire and the design the light plays between it and the old running shoes.